You're out for dinner with friends. Everything's great until... it's time to divide the check. Someone didn't have a drink, and objects to paying for those who did. Someone else didn't order dessert, and would prefer not to pay for those who did. You get the picture; you're going to be there all night coming up with fair amounts for everyone. Tap in the check total and the number of people dividing the check. Enter the tip amount (if any), as either an amount or a percentage of the check total. Enter the amounts that not everyone is going to pay, and the numbers of people paying them. Entries are available for drinks, dessert, appetizers, and "other". Enter all of them, some of them, or none of them; it's up to you. 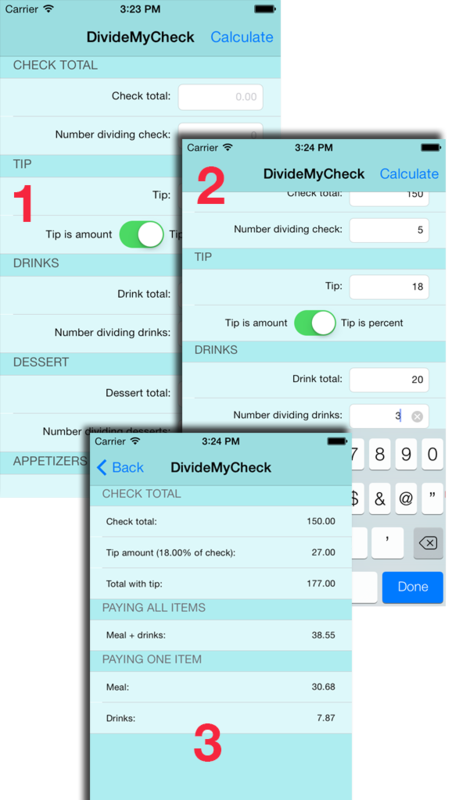 Tap Calculate and... you get a correctly-divided check. Everyone goes home happy, especially you, because it only took a few seconds to do all that math!